Can you believe that we are already mid way through this week! One more day closer to Christmas! 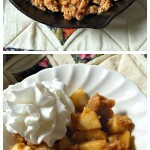 Either way I am hoping to bring you cheer with this beautiful and easy recipe today! This past weekend we went up to get out Christmas Tree! John’s grandparents own a tree farm up in the mountains of NC so we ,meaning him, my mom and I, climbed into the SUV and took the wet and dreary ride up the mountain to get our first real Christmas tree! We spent some time with his family up there and had a great time showing my mom around the little town of Newland, NC. A very small yet quaint little town that is probably 90% Christmas trees, no joke. It actually makes me quite excited that we have gotten our tree and will decorate it this weekend! I am so ready for the season. 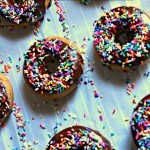 Now, as I have promised a warm, yummy and easy recipe! 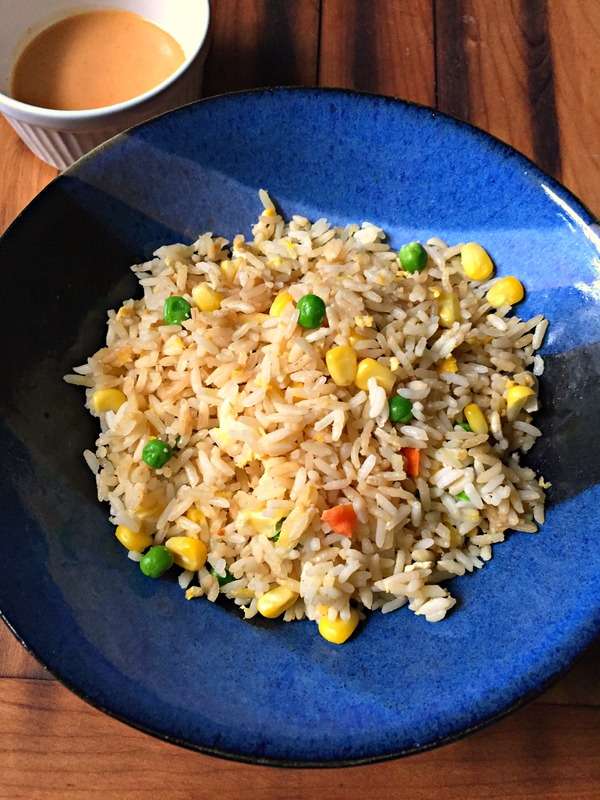 Vegetable fried rice! 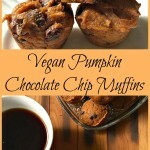 This recipe I discovered while in college when I was experimenting with becoming a vegetarian. I did it for a whole 11 months until Thanksgiving that year (2012). It was no easy feat considering my favorite vegetable beforehand was a French Fry (extremely healthy right?). 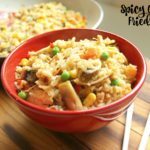 I explored and experimented with different dishes and found that I am a huge fan of rice cooked just about any way you give it to me! I could seriously make a meal of vegetable fried rice egg rolls about 4 nights a week and would never get sick of it. Mix your rice and water together into a large microwave bowl with a top. Cook in microwave for 14 minutes (yes it will make a mess you can either do this in the microwave or on the stove). Once your rice is cooked heat your coconut oil until it is hot enough to saute in. If your vegetables are uncooked saute them and then add some more oil for the rice. Place your rice in the pan and let it saute and fry for a few minutes. Add in your garlic and onion and stir around. Whisk your eggs and then make a spot in the middle of the rice for the eggs. 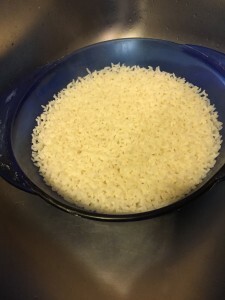 Pour your eggs in and stir gently into the rice. The egg will cook as the rice is frying. Then add in your vegetables. Stir all together and add in your soy sauce. Let cook altogether for about 2 minutes and stir it often. Serve with some chicken, zucchini or with some egg rolls for a light dinner or lunch! 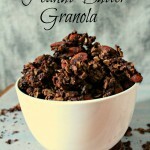 Perfect to make a bunch ahead and eat on it throughout the week too! Only takes about 1 minute to heat back up! 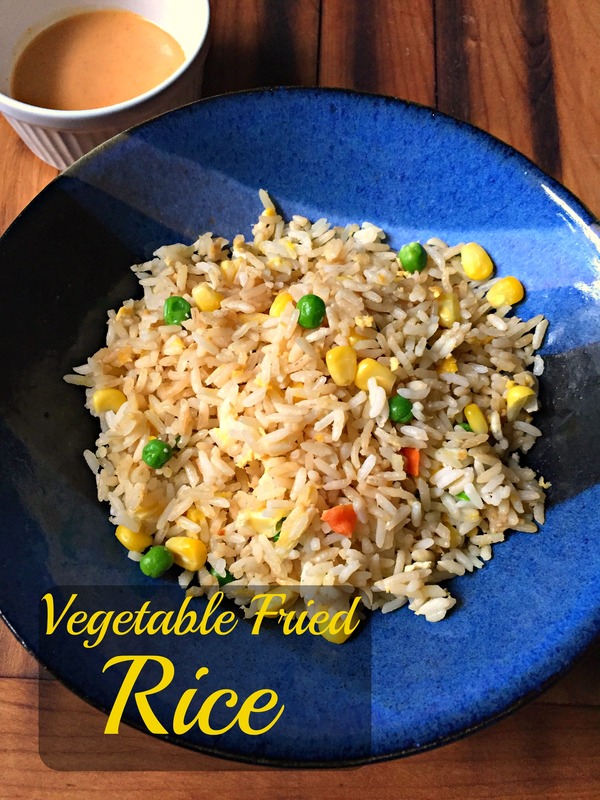 I love this quick and easy dinner of vegetable fried rice because it is filling yet not so heavy with meat. Meat in my house has to be at just about every meal and every now and again my other half will be okay without his precious protein, or he will just want a light dinner because he had a big lunch. 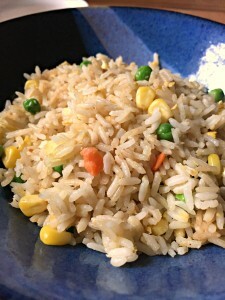 It is nice to have something different that isn’t difficult and this rice dish can easily pair with a teriyaki chicken or a garlic chicken perfectly as well as steak too! You can even get fancy and cook your rice in chicken or beef broth to bring some added flavor into the mix too! 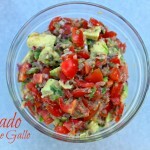 It is so easy to create new things with this dish! Follow me on Instagram (@notshabbygabby), Twitter (@not2shabbygabby), Pinterest (@2not2shabbygabby) and Facebook to stay up to date on all posts and teasers! Wow, this sounds so good! Thanks for sharing at My Flagstaff Home! Thank you Jennifer! I love your link up!